Yellowstone is the first national park in the world and to this day still holds many geographical and pioneering records. March 1, 1872, marked the first day of park hood and it is still the largest national park in the United States with well over 2 million acres to explore and enjoy. The park's highest point is Eagle Peak standing at a formidable 11,358 feet. Surprisingly, even the lowest point in the park is an impressive 5,282 feet above sea level. There are over 300 geysers in Yellowstone Park, as the whole of the park is considered to be an active volcano. It contains a caldera (an abyss or crater) that is one of the largest in the world. The Yellowstone caldera, under Yellowstone Lake, is the biggest supervolcano in North America. Yellowstone Lake ranks in the top few largest high-altitude lakes on this continent. The park has almost 10,000 geothermal features in total with relatively 300 geysers and the park experiences approximately 2000 earthquakes each year. This is truly one of the most studied hot spots in the world. Yellowstone is part of the biggest almost intact ecosystem in a temperate zone in the northern hemisphere. It contains a petrified forest that is also one of the biggest on earth. Because of the size, Yellowstone National Park has a great amount of biodiversity. Most experts consider Yellowstone to be the best megafauna wildlife habitat in the lower 48 states housing the gray wolf (endangered), grizzly bear (threatened), lynx (threatened), pronghorn antelope, mountain lion, bighorn sheep, mule deer, wolverine, moose, elk, mountain goat, black bear, and bison. Yellowstone has 18 fish species including the Yellowstone cutthroat trout. 6 reptile species, 4 amphibians, and 311 bird species are reported to be living in Yellowstone. 1,700 native vascular plant and tree species endure the Yellowstone climate, with 80% being lodgepole pine. Yellowstone geology is also breaking records. The Old Faithful geyser is perhaps the most famous geyser in the world. The Steamboat Geyser is the largest active geyser in the world. Approximately 50% of the geothermal features on earth and over 66% of the geysers in the world are in Yellowstone National Park. The first people came to Yellowstone Park nearly 11,000 years ago and over time, 21 American Indian tribe affiliations have been discovered. There are a significant number of archaeologically preserved areas in the park that support this. For the past 10,000+ years, people have recognized and been enjoying Yellowstone for its outstanding qualities. It is open year-round and has seen roughly 2 million visitors or more since the mid-1960s. In 2009, park visitation was up to 3,267,683 people and maintains similar counts in recent years. Yellowstone National Park is a must-see national park destination. Canyon Lodge offers nice, comfortable and roomy Yellowstone National Park lodging accommodations for a great price. These spacious accommodations are perfect for larger groups or families vacationing in Yellowstone. Grant Village offers comfort and convenience inside Yellowstone National Park. In addition to the lodge, the village has dining, gift shop and all that is needed to make your Yellowstone vacation a truly exceptional experience. Accommodations at the Old Faithful Snow Lodge range from spacious hotel rooms to comfortable cabins. The Snow Lodge is open early May to mid-October and then reopens before Christmas until about the end of February. Old Faithful Lodge Cabins are located very near to the Old Faithful geyser and provide outstanding views from the main lodge. These cabins allow pets. Lake Lodge Cabins are a cluster of cabins near Yellowstone Lake inside Yellowstone National Park. Here you will find comfort, convenience, and friendly service. These cabins are perfect for individuals or groups. Mammoth Hot Springs Hotel Cabins provide simple yet comfortable rooms with in-room telephones, at a great price. Mammoth is open throughout the year. 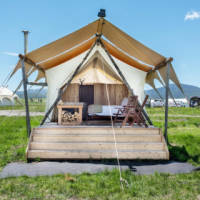 Yellowstone Under Canvas provides a unique Glamping experience just west of Yellowstone National Park's western gateway. Choose from a variety of luxury camping options. 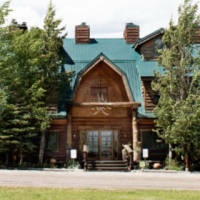 The Three Bear Lodge is one of the most well-established hotels around Yellowstone. From the quality rooms to the famous restaurant, these amenities will make your stay an enjoyable one. Take some time to enjoy the outdoor pool. The brand new Explorer Cabins in West Yellowstone are situated in the heart of town and just moments away from the parks west gate. These private cabins provide the finest in comfortable accommodations, amenities, privacy, and convenience! Gray Wolf Inn Suites is located in the perfect spot for all of your Yellowstone adventures. Gray Wolf Inn Suites will help make your vacation a one of a kind memory. Absaroka Lodge is located just five minutes away from the North Entrance to Yellowstone National Park. Enjoy easy access to the park, local shops, and restaurants. Yellowstone Big Rock Inn opened its doors in the summer of 2016, and is a seasonal Inn open from May to October and is located in the town of Gardiner Montana within walking distance to shops, restaurants, shops, lounges and a grocery store. Enjoy beautiful views from your room, or on the expanded balcony, of the Electric Peak and surrounding mountain ranges. The Inn is approximately one mile from the North Entrance of Yellowstone National Park. Just a short drive to your Yellowstone adventures. The Historic Madison Hotel was originally built in 1912 and is located in the town of West Yellowstone, less than one mile from the west entrance to Yellowstone National Park. Though permeated with a historic hotel feel, recent improvements provide guests with a satisfying and economical stay while visiting Yellowstone. Yellowstone Park Hotel is a western boutique style hotel with all the comforts you have come to expect from a higher end hotel. Some guestrooms feature fireplaces and Jacuzzis. Park Hotel Yellowstone offers the best of vintage Yellowstone with its tastefully renovated historic rooms and convenient location just 1 block from Yellowstone's north entrance in the heart of Gardiner, Montana. Located right along the banks of the Yellowstone River, only about a mile north of Yellowstone Park. Amenities include an indoor heated pool, hot tub, steam room, cocktail lounge, laundry facilities and restaurant. Brandin' Iron is located in downtown West Yellowstone and provides some of the areas best lodging, including a free hot breakfast every day, be sure to stop at the fast and friendly activities desk! Fresh air, breath-taking scenery, and year-round outdoor recreation await you here in the Holiday Inn West Yellowstone. This West Yellowstone Holiday Inn offers many amenities that will help make your stay carefree and enjoyable. The Clubhouse Inn is located right next door to the west entrance to Yellowstone National Park. With several accommodation options to choose from plus all the amenities that you could ask for, you can't go wrong with booking your vacation stay at the ClubHouse Inn. Whether you’re traveling for business or pleasure Days Inn by Wyndham West Yellowstone has everything for a comfortable, modernized stay. The Best Western Desert Inn is a full-service hotel located in West Yellowstone, only three blocks from the west entrance to Yellowstone Park. Free breakfast, heated pool, and cable TV. Pines Homes is 0ne of the best outdoor playgrounds for young and old. As Idaho's finest luxury cabin resort, cabins include amenities like a fireplace, washer, and dryer, satellite television, hot-tub. The Rainbow Ranch Lodge combines the rustic rugged West with classic elegant sophistication. The Rainbow Ranch Lodge is the perfect escape for couples, families, corporate gatherings and weddings. Sawtelle Mountain Resort is ideal for your group or family vacation. Located in Pines Island just west of Yellowstone Park, Sawtell Mountain offers comfortable lodging great service. Located along the banks of the Shoshone River, the Pahaska Tepee offer a variety of lodging options for any size family. The property also includes a fuel station and convenience store. Enjoy your stay in cozy log cabins with private baths, tucked privately amid the trees. Eat your meals at the full-service restaurant and bar. After a long day experiencing all the area has to offer, relax in the heated swimming pool and hot tub, or get some work done with the full internet access. The Big Bear Motel is located in the town of Cody, Wyoming, east of Yellowstone National Park. 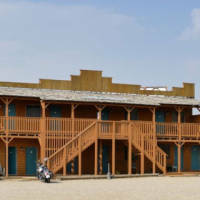 The Big Bear Motel is located less than one minute from both Old Trail Town and the Cody Night Rodeo and only three minutes from the world-famous Buffalo Bill Historical Center. Headwaters Lodge and Cabins provide the perfect lodging base camp for visiting both Yellowstone and Grand Teton National Park. The central location provides easy access to millions of acres of National Park beauty. If you are getting ready to go on the Yellowstone vacation of a lifetime but are still struggling with finding the ideal Yellowstone National Park lodging for your needs, then look no further than the user friendly website of US Park Lodging. For quite some time now, this website has been up and running to provide each of our valued clients with a useful place where they can gather suitable information in order to make more informed decisions before going on vacation. The rates, pictures, details of the surrounding areas and activities, and so much more can all be found at www.usparklodging.com and you will be delighted with the wealth of information that is included for the numerous locations one may choose to spend their vacation at. On top of the numerous locations and plentiful information, you will also be happy with the quality customer service because we will see to it that the needs of all our guests are taken care of with the utmost professionalism and in a highly timely fashion. The benefits are quite numerous and that ideal vacation which you have wanted to go on can be found in one place, so visit the professionals at US Park Lodging for further details because we are ready to assist in putting together the perfect get away. One of the first and foremost aspects of this website which many people come to love is quite simply that there is plenty of information available. There is more than enough information listed so that making an informed decision will be much easier than it was before and you will be delighted with the numerous vacation choices listed in detail on our website. For example, have you ever wanted to visit the Grand Canyon? There are several details for travel arrangements to the Grand Canyon. On top of this, US Park Lodging has information for Yellowstone National Park lodging, Death Valley, Bryce Canyon, Zion Park, Crater Lake, Arches Park, Monument Valley, Mesa Verde, and Canyon de Chelly. Under each category, there are several details for each lodge location. For example, Yellowstone National Park lodging can include the Old Faithful Inn, Lake Lodge cabins, Mammoth Hot Springs hotels and cabins, and so much more. Finding Yellowstone National Park lodging or lodging in any other similar area is much easier than it ever has been before, so to get a head start on planning for that vacation, visit the professionals at www.usparklodging.com for a little extra assistance. Now that you are just a little bit more familiar with how simple it can be to find Yellowstone National Park lodging or a good place to stay in several other ideal vacation spots, why not get in touch with these professionals? US Park Lodging has the ideal vacation waiting for you in one of our tasteful settings. All you have to do is choose the location and let us help you with the other details - it's simple! Yellowstone National Park lodging of the right kind can be found through our website and all the information you need is waiting there too. If you are on the lookout for some high quality Yellowstone Park lodging, then you are more than likely well aware of just how time consuming it can be to narrow down the choices until you find one that is suitable to your tastes as well as your budget. Many people spend hours of their time placing phone calls and looking at previous guest comments only to discover that their time may have been wasted, especially if the right Yellowstone Park lodgings were not found. 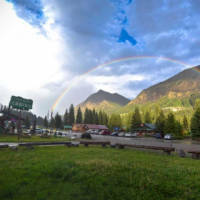 However, there is now a much easier way to find reasonable accommodations in Yellowstone that are quite beautiful, and in this instance, the answer lies at the user friendly website of www.usparklodging.com. For quite some time now, our website has been up and running to provide each of our valued guests with enough information so they can make informed decisions in half the time, so not only do you get to save money with these Yellowstone Park lodging accommodations, but you also get to save plenty of time in the long run. The benefits are numerous and one of our friendly guest service specialists would be more than happy to assist you in assembling the details for the perfect vacation, so be sure to visit our website for further details. When looking for quality Yellowstone Park lodging, US Park Lodging has all your needs taken care of. Our website makes sure to include all the details necessary in deciding which of our lodgings to stay in, and it all starts in deciding what type of room you require. Choose between a suite or a semi suite, east wing geyserside or east wing standard accommodations, west wing front side or west wing standard, old house room or an old house room with a shared bathroom, and several others. These are just a few of the options we have made sure to include so that each of our valued guests will more than likely find Yellowstone Park lodging that suits their needs and unique tastes. The nightly prices are listed next to each room style and there are several detailed photographs that readily display the beauty that can be found in the area. For details regarding the room amenities, we have also made sure to include all the many details that are available for each style of room that you may choose. Yellowstone Park lodging has just gone up a notch in quality thanks to the superior highlights brought to you by US Park Lodging. Now that you are only a little bit more familiar with the numerous features that can be found at our website, why not go online to get a closer look? 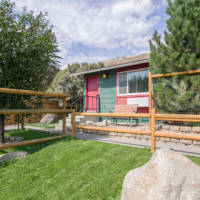 To find the Yellowstone Park lodging you require during this vacation, all you have to do is find a comfortable chair, sit back, relax, and browse through www.usparklodging.com because there is more than enough information available. Quality service is something you can come to expect and our website is ready to help you get started.